Over the years, I had sometimes found myself bursting at the seams with creativity. I could feel it under my skin. That itch to get my hands on something to get the ideas out, whether it’s paper, digital, writing. Something! But alternatively, I’ve also found myself wishing to no end that an idea would just COME to me already. I would sit and look at a blank piece of paper or an empty screen, get up, pace around, huff and puff and annoy my husband to no end, but nothing seemed to happen. Yes, it’s the dreaded case of Artist’s (or Writer’s) Block. It’s bound to happen to anyone who seeks to express themselves creatively. So to combat this all too common problem, I’ve made this handy list of 18 tips to help you earn the favor of the muses! Set the mood in your workspace. Surround yourself with items that make you happy. Even light a candle or play with scents. Tidy your space. Nothing seems to kill my inspiration and creative mood like a messy, cluttered workspace. Take a few minutes to tidy up before beginning. Remove distractions or remove yourself from distractions. As the mother to a toddler, I understand that this can be difficult. Wait until the kids are in bed, turn off the television, even unplug the router if you find the internet to be a distraction. Take a nice relaxing bath. Go for a walk. Make sure you take a moment to take in the fresh air, and pay close attention to the details of your surroundings. Doodle. Don’t think, just draw and let your mind wander. Read a book. If you are wanting to create a new piece of artwork, pay attention to how the author describes the characters and scenery. If it’s writing, pay attention to how the author uses words to paint a mental image of the story they telling and how the author weaves their story to help organize your own ideas. Keep a dream log. Keep a small notebook by your bed and jot down a description of your dreams before they fade. Dreams are a plethora of creative ideas with little to no effort from you! Harness these free bits of inspiration. Carry a notebook while away from home. Jot down little bits of what you see around the world as they strike you, and come back to your notebook when you are lacking ideas. Carry a sketchbook while away from home. This can have the same effect as carrying a notebook. You could even combine the two. Meditate. Meditating beforehand will help clear the clutter in your mind so ideas can flow freely. Do some light exercise. Exercise can help get the blood flowing, which means more blood to the brain and also boost energy. Make sure you aren’t wearing yourself out, though. It’s hard being creative when you are exhausted! Listen to music. Better yet, listen to music based on the mood you are looking to capture. Painting an angry picture? Break out the heavy metal! Writing a romantic scene? Put on some soothing romantic tunes. Search works of art. Remember, not to plagiarize, but to become inspired. Pay close attention to colors, composition, and the mood the artist was trying to capture. Take photographs. Much like with the notebooks, capture pieces of the world around you that strike you with quick photos. They don’t have to be amazing photographs. The camera on your phone will work just fine. Watch a movie. This can serve two purposes. The first is relaxation. The second, is story and scenery. Three for one! Take a nap. Also like meditating, taking a short nap will help clear your mind of stress and clutter, and also give you the bonus of a nice recharge. Eat a light snack. Being ravenous will do little to help you focus. Eat a snack large enough to stave off hunger, but small enough to keep you from feeling bloated and heavy. 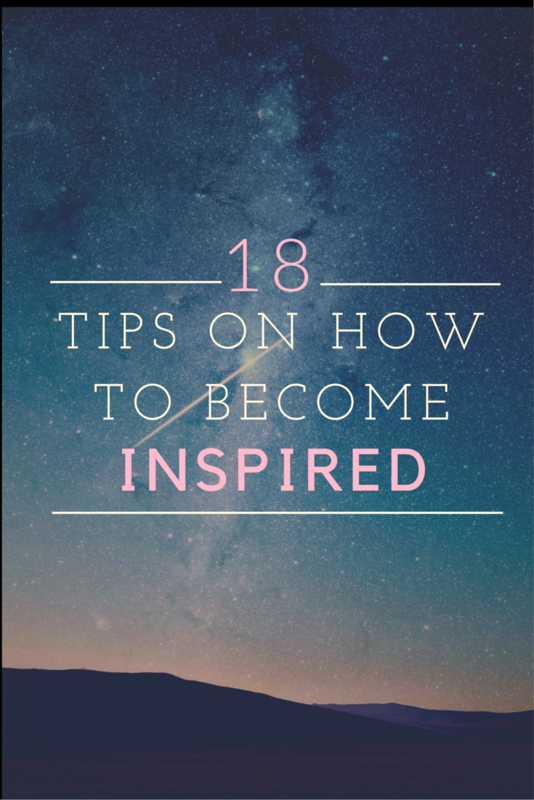 What ways have you found to help you become inspired? Feel free to comment and give us your own tips and tricks! Being aquatic by nature, I tend to sit in nature near water, it works really well for me because it seems to drown out all of my thoughts of the real world and real problems and just allows me to think about what I want to.